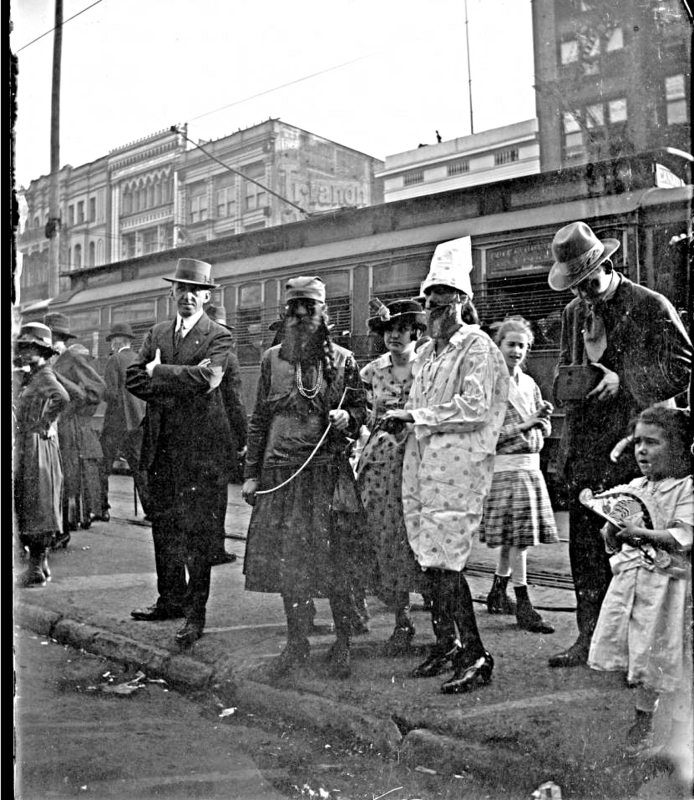 There were no parades for Carnival, 1919. World War I ended on November 11, 1918, so the krewes did not plan to parade in 1919. The happy circumstance of the war ending brought out maskers and revelers, though. This John Mendes photo shows an interesting group of maskers and others in the 800 block of Canal Street. The streetcar is a “Palace” car, from American Car Company. The “Palace” cars were generally considered to be the most comfortable that ran in New Orleans, including the arch roofs. The operating company in 1919 was New Orleans Railway and Light. It would be four years before the big purchase of arch-roofs from Perley Thomas. There is a “ghost ad” for “Trianon” on the building behind the streetcar. The actual name of the palace in Versailles, France, where a number of treaties were negotiated over time, is “La Grand Trianon”. The treaty that formally ended WWI wasn’t signed until June 4, 1920. Interesting coincidence. Zoom of Mendes photo from 4-Mar-1919, showing “Trianon” ad. Parades resumed the following year, 1920.